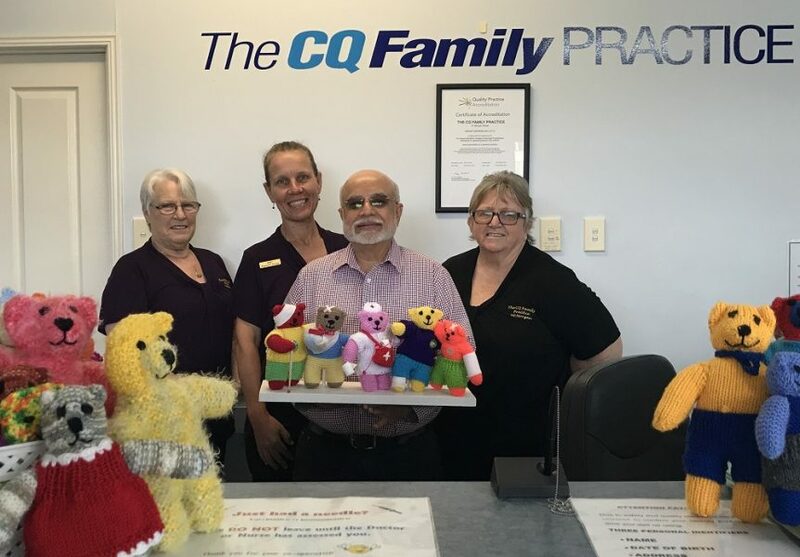 Medical, nursing and administrative staff at the Central Queensland Family Practice in Mount Morgan have created an inspirational Share and Care Bear Project to take the ‘sting’ out of immunisations or other unavoidable painful experiences for children and their parents. Children can choose from a selection of free bears which have been hand knitted/crocheted, stuffed, embroidered and dressed by practice staff. Each child is encouraged to cuddle, hold and talk about their bear during the experience, giving it a name and taking it home with them to keep. It has been a simple and successful way to promote child and parent/carer comfort and satisfaction, expressed through children’s smiles when they draw the bear in close for a hug and a kiss. It’s about each child and family being offered care and understanding in a holistic and meaningful manner. While teddy bears are a child’s best friend, they have also proved successful with elderly patients and those with disabilities. Staff also held a workshop for patients, carers/families following the positive response to the project and to help keep up with demand for the bears. Participants received tuition in basic knitting/crochet techniques and provided with knitting needles, crochet hooks, acrylic yarn, patterns and fibre filling for the bears. Following the success from this workshop additional plans at the practice include promoting knitting or crocheting in the waiting room to encourage discussion among patients to reduce anxiety/stressful feelings while waiting to consult with the GP or Practice Nurse. Read the full report about this project from Rebecca Rendalls Promoting care, compassion and cohesion in general practice. CQ Family Practice has an efficient, cost effective primary health care program and encourages and assists other practices to do the same. For more information contact CQ Family Practice cofamily@hotmail.com or phone (07) 4938 2008.